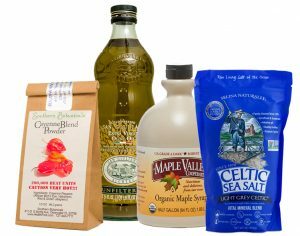 Our Organic Maple Syrup is 100% pure and organically produced Dark Robust Maple Syrup. A delicious, rich-tasting traditional maple syrup – nothing artificial, additive- and preservative-free. Great effort has gone into selecting woodland farmers whose standards represent stewardship to the environment and our planet. 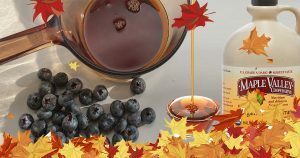 Dark Robust (formerly known as Grade B) is the late season, darkest, most richly flavored of the table grade maple syrups and is recommended for use in the Master Cleanser program. On Sale Now just in time for all of your Holiday cooking! 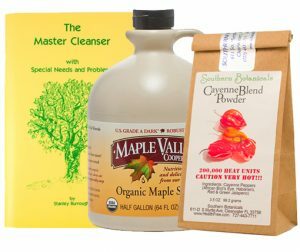 Every Half Gallon Maple Syrup purchased this season includes a FREE e-book with 16 Delicious Maple Syrup Recipes. Add two tablespoons of maple syrup and the juice from one half of a lemon (which happens to be approx two tablespoons of juice) to each 10 oz glass of water. So, one could say that equal portions of lemon juice and maple syrup are used. Knowing this, we can squeeze enough juice out of lemons to fill up a pint-sized jar halfway, and then fill up the rest of the jar with maple syrup. Add a pinch or a tad of our very hot Cayenne pepper, screw on the lid, shake well, place in the refrigerator and you have the makings for 6 pints sized servings or 12 cups sized servings. Pour 1/3 cup (6 tablespoons) in a pint-sized jar, add water to the top, and a pint-sized lemonade serving is ready for your enjoyment. When using this preparation for making 8oz cup servings, add three tablespoons of it into the drinking container, and then fill to the top with water. The maple syrup preserves the enzymes and other nutrients in the freshly squeezed lemon juice for more than three days while refrigerated. Mix together tahini, lemon juice, maple syrup, , thinned with a little water, and salt and pepper for a delicious salad dressing. Mix with Cashew Butter for a sweet, healthier frosting for your favorite dessert. 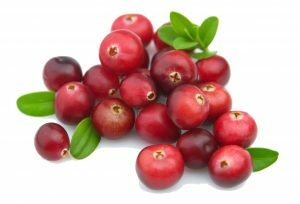 Boil 1 cup organic cranberries in 1 1/2 cups maple syrup until they pop open. Pour sauce over baked apples or any dessert, or turkey. Simmer 1 cup maple syrup in a small pot with 2 cups blueberries for 4 minutes. Mash slightly and it is ready to use on pancakes. So easy! Great option to replace sugar or sugary creamers. Mix all the ingredients together. Spread evenly on a baking sheet lined with parchment paper. Bake until fragrant and crisp, 10 to 12 minutes. Sprinkle with 1/4 teaspoon Celtic Sea salt. Combine 4 Tablespoons Dijon or stone-ground mustard with 4 Tablespoons maple syrup and 1 Tablespoon olive oil. Add 1 chopped garlic clove and some fresh or dried rosemary or thyme. Mix well and spread glaze over chicken or salmon, then bake as usual.